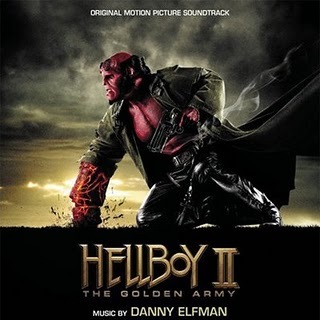 After my first few listens through Danny Elfman’s score for Hellboy II: The Golden Army, I had pretty much decided that too much of it was unfocused noise; it was certainly written in Elfman’s easily-identifiable sound, but never quite seemed to gel together as a cohesive score. But then, quite suddenly, the whole thing opened up, and it hit me. I got it, and the wonders of this quite excellent work were revealed. This is probably the best Elfman super-hero score since Batman Returns some fifteen years ago, eclipsing such fan-favorites as Hulk, and his two massively popular Spider-Man scores. The film, directed by Guillermo del Toro, is a sequel to the critically acclaimed 2004 movie Hellboy. Ron Perlman returns as the red-skinned, cigar-chomping, wisecracking demon who, in the first movie, was saved from the Nazis and turned into a crime-fighting force for good. This time around, Hellboy locks horns with a pair of Elven royalty, Nuada and Nuala, who have been secretly attempting find the shattered fragments of a magical crown which, when reassembled, would resurrect the mythical Golden Army, and help them take over the world. The film also stars Selma Blair, Doug Jones, Luke Goss, Anna Walton and John Hurt. I think part of my initial reticence about this score was the fact that Marc Beltrami didn’t write it. While director Del Toro has long harbored desires to work with Danny Elfman, the fact that the original Hellboy was one of the best scores of Beltrami’s career, and had helped create a musical world for the film to inhabit… well, the fact that he was summarily dropped sort of rankled. However, now that I’ve got over that, I can certainly recognize the excellence of Elfman’s work. In many ways, it’s a perfect fusion of the old and new Elfmans – it has the thematic strength and the sense of awe and wonder that characterized fan favorites such as Batman and Edward Scissorhands, but also contains a lot of the denser, more complicated compositional techniques he has adopted in the last five or six years. His main theme, a simple four-note motif first introduced during the “Hellboy II Titles”, appears with regularity throughout the score, and although it’s nowhere near as prominent or memorable as Beltrami’s Hellboy theme, it at least brings a certain level of consistency to the music. Rather than being a prominent, in-your-face theme, it instead functions as a repeated backbone, appearing deep in the mix in several cues, providing the musical framework for the rest of the score to hang upon. The action music, as one might expect, is vivid and complicated, taking its inspiration from scores like Sleepy Hollow, Planet of the Apes and Spider-Man. The orchestrations in cues like “The Auction House”, “Where Fairies Dwell”, “Market Troubles” are quite spectacular, as Elfman and his team pit fat brasses, wordless choirs and powerful percussion against resonant solo performances – cellos, bassoons, a theremin – which are mixed with great clarity and precision. It’s quite something to be able to clearly pick out a single instrumental line from deep within the performance, and is testament both to Dennis Sands’ recording, and to Elfman’s clever writing. It’s also worth noting the mind-blowing flutter-tongue performance technique the brass section adopts in many cues, which must have been tremendously difficult to play. Elfman’s action music has always been good, but in recent years the level of sophistication in his more intricate cues has risen considerably, and Hellboy II continues the trend. The more lyrical aspects of the score are pure 80s Elfman, from the chilly-pretty chords, tolling bells and wordless choirs that come straight from Edward Scissorhands, to the rampaging brass and percussion writing which screams Batman. Cues like “Father and Son”, “The Last Elemental”, “The Spear”, the subtly gorgeous “A Dilemma” and “A Choice”, and “In the Army Chamber” at times reach almost operatic proportions, with the conclusive three or four cues being especially noteworthy for their size, scope, and emotional intensity. More than that, they are also wonderfully nostalgic throwbacks to a time when Elfman was the king of the Gothic score, and many fans – myself included – will enjoy hearing the once wildly-popular style re-birthed in a new setting. There are also a couple of oddball cues – the quirky pizzicato rhythms of “Teleplasty”, the faux-German opera in “Mein Herring”, the bulbous rhythms and exotic percussion of “A Troll Market” – which reminds us that, for all the apocalyptic overtones and battles between good and evil, Hellboy films are also pretty funny at times. With this score, and with Standard Operating Procedure and Wanted, Danny Elfman is having an absolutely stellar 2008. He’s a composer at the top of his game, overflowing with ideas, and not afraid to tackle vastly different films in different genres. What’s most impressive is that he is succeeding at all of them; his scores are both intellectually fulfilling and great fun to listen to – and you can’t ask for more than that. Music composed by Danny Elfman. Conducted by Rick Wentworth. Orchestrations by Steve Bartek, Edgardo Simone, David Slonaker, Jeff Atmajian and Mark McKenzie. Recorded and mixed by Dennis Sands. Edited by Shie Rozow Album produced by Danny Elfman.